Developments in the last 18 months have given us the impression that we live in a China-centric manufacturing world but a US-dollar centric financial world. Europe is uniquely exposed to Chinese economic activity to the extent that investing in European industrials has now in part become a bet on the macroeconomic performance of China. Meanwhile, Europe’s banks are uniquely sensitive to global liquidity and dollar funding conditions. 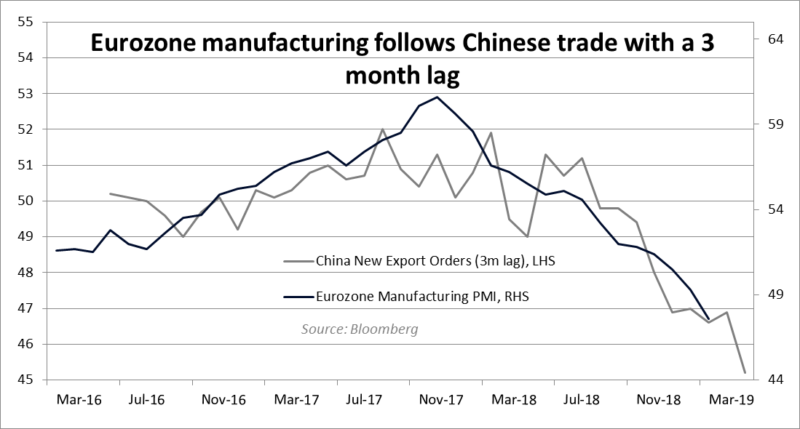 Since mid-2016, as Figure 1 shows, Eurozone manufacturing PMIs have tracked China’s export orders index – an indicator of internationally focused industrial activity – with a three-month lag. Figure 1 shows the relationship between the purchasing managers’ index for Eurozone manufacturers with the index for China’s export orders lagged by three months. Slowdown in demand for Chinese exports can have a knock-on effect for Chinese producers’ demand for European imports of capital goods. One manifestation of this new China-Europe link is the collapse in car sales in China. 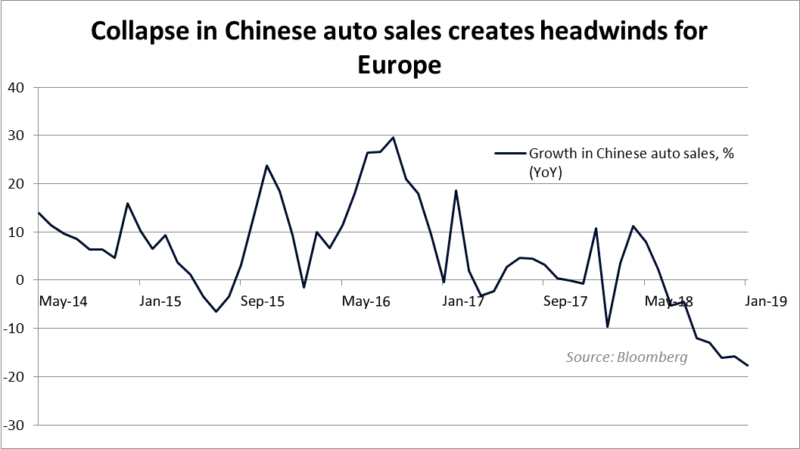 Annual growth in sales of automobiles has been consistently above 5% since at least 2014, and there is strong demand from Chinese consumers for German and European cars. Since summer last year, however, sales growth turned strongly negative. Figure 2 shows that since the middle of 2018, car sales in China have significantly fallen. Even when car sales recover, the shift towards Chinese-made models and the growth of electric vehicles will continue to harm European makers of diesel-based engines. Since the mid-2000s, the German economy has hitched its wagon to China, growing its exports to the country by over $70bn per year. In contrast, the combined increase in exports to China from Italy, France and Spain is just $29bn, according to World Bank figures. It is no surprise, therefore, that Germany and its manufacturing sector have been the worst hit by China’s slowdown. But we should not forget other essential states in the euro area. With a $2 trillion economy, a public debt-to-GDP ratio of 130% and an unemployment rate at 10%, Italy plays a pivotal role in the fortunes of the euro area. Italy fell into technical recession in Q1 2019 as GDP fell by 0.1% for the second consecutive quarter. Italy’s macroeconomic problem is that its core inflation rate is too low. Except for very brief periods, the rate has sat below 1% since 2014. 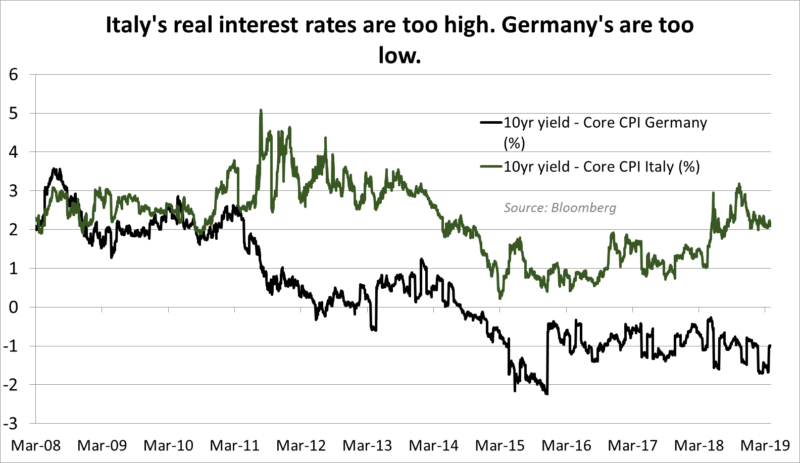 This creates problems because it keeps borrowing costs in real terms too high. Figure 3 shows the divergence in real interest rates between Germany and Italy, illustrating the perversity of the ECB’s single interest-rate policy, which when adjusted for inflation can yield counter-productive results. 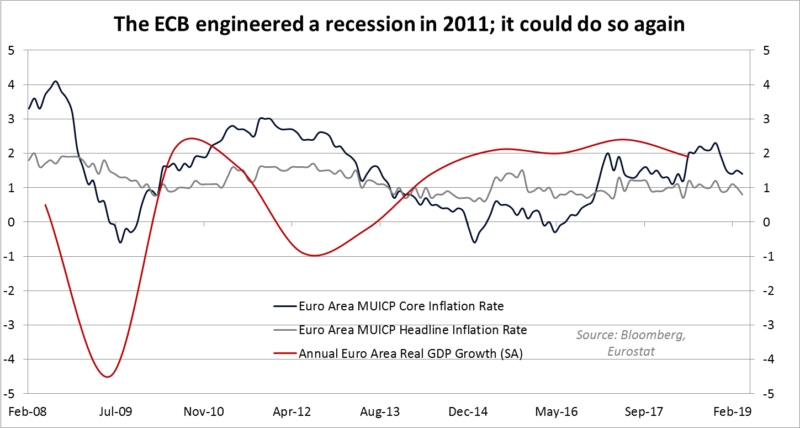 The ECB is somewhat condemned to this situation because if it eases policy too much to suit Italy, it generates too much inflation for places like Germany, and if it tightens too much for Germany, it can push countries like Italy into deeper recession. The ECB could simply buy more Italian bonds to influence only Italian rates, but there would be significant push-back from Germany and other northern European states which worry that such a move would amount to debt-sharing by the back door. Figure 3 shows that real interest rates in Italy have diverged from those in Germany since the Eurozone recession of 2011. A combination of higher nominal yields and lower core inflation in Italy is to blame. But the ECB’s problems extend beyond Italy and focus on the bank’s preference for too-low inflation across the bloc. 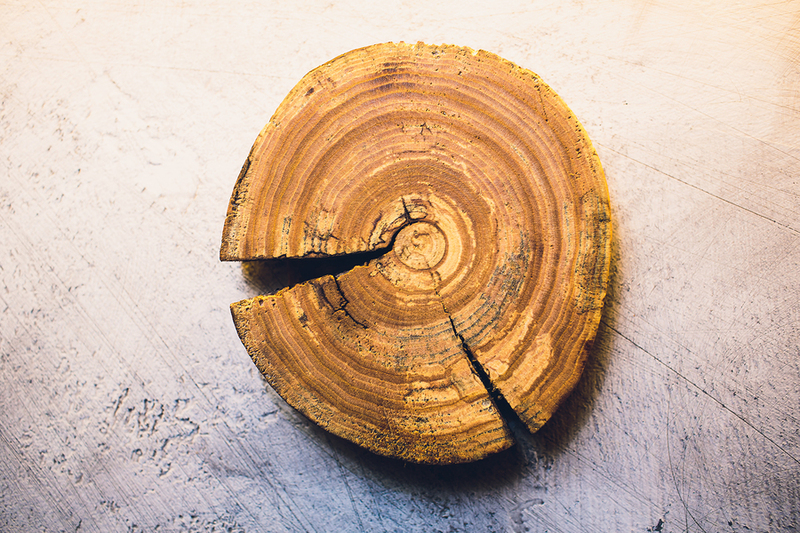 Low core inflation suppresses consumer demand and begets expectations of lower inflation in the future, as consumers delay their purchases and keep demand weak. Similar to the Bank of Japan’s inadequate efforts to reflate Japan in the 1990s, the ECB may have lost its credibility to deliver higher prices by being too slow and reluctant to respond to economic slowdowns in the past. Inflation expectations are much lower in Europe than they are in the US. Figure 4 shows that Eurozone inflation expectations as indicated by 5-year, 5-year forward inflation swaps have been stubbornly low, indicating that consumers and investors have limited confidence in the ECB’s ability to raise inflation towards its 2% target. Italy and indeed Germany need stimulus, but they are unlikely to get it from an ECB that – due partly to the influence of anti-inflationary Northern European states that themselves enjoy higher inflation and partly to the ECB’s own ideological biases – is reluctant to implement a more suitably aggressive stimulus. Further, the ECB has a proclivity for targeting headline inflation, which is influenced by volatile energy and food prices, instead of core inflation, which remains stubbornly low across the euro area. It wouldn’t be surprising if the ECB were to use rising headline inflation (that is likely to come through from higher oil prices) to justify their preference to tighten monetary conditions. That would be a disastrous move, but one that befits an organisation which did just this when headline inflation accelerated during 2011 but growth was slowing and trouble was brewing in banks and within sovereign debt markets. Figure 5 shows core and headline inflation rates in the euro area measured against the region’s annual real rate of GDP growth. The ECB embarked on a period of rate rises in 2011 in response to rising headline inflation, despite signs of slowing growth and trouble in banks and sovereign debt markets. Interest rates in the euro area are now negative, but as a result of poor monetary policy decisions and delayed stimulus from the ECB in the last decade, the central bank has managed to create an environment of slow growth and low inflation despite low rates. This limits how much ordinary stimulus the Bank can apply if conditions in Europe remain weak. Easier Fed policy may help European banks to get dollar financing on easier terms, but that is unlikely to be enough to arrest what appears to be a sharp decline in euro area manufacturing activity that persisted over the last six months. We think that Europe could enjoy a modest short-term recovery if the stimulus in China and the United States is large enough to raise demand for European exports and liquidity in global financial markets. But for more sustainable results, there needs to be greater public spending, not just in Italy but in Germany too. With Italy’s debt burden already very high, stimulus in that country will require assistance from its European partners. Europe suffers from deficient demand and has relied on export growth to plug it. That strategy appears to be unsustainable. Even if China recovers, it plans to reduce its reliance on European imports under the Made in China 2025 programme. Therefore, there needs to be a rethink of the euro area’s governing ideology of low inflation, fiscal restraint and restrictions on debt sharing. Euro states need to allow the ECB to be more radical, national treasury departments to be more active and low-debt states such as Germany to help out high-debt states such as Italy. That is easier said than done.